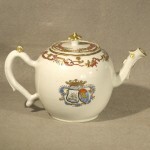 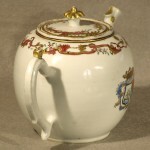 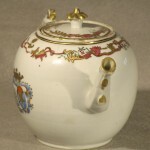 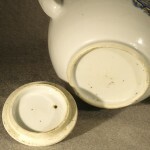 An 18th century globular form Chinese teapot. 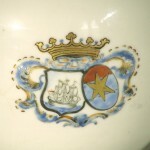 Two side have an armorial device of a cartouche containing a three masted sailing ship within a shield and and a gold star within an oval,all surmounted with a gold crown. 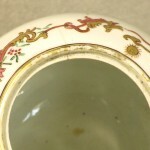 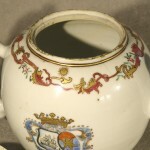 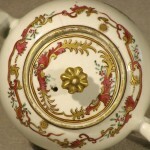 The edge of the lid and upper part of the body have a colorful linked design of C scrolls, leafage, sprigs with berries and two smiling gold suns. 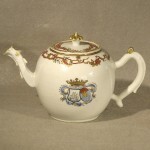 This was possibly made for the Dutch market. 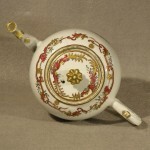 5 1/8" high, 8 3/4" long, 4 1/2" diameter.